Pierce Brosnan and Owen Wilson star in NO ESCAPE. ©The Weinstein Company. CR: Roland Neveu. Written and directed by sibling filmmakers John and Drew Dowdle (best known for their horror films), Wilson plays a family man who on his first day in a new country (the country is never named but the film was shot in Thailand) bears witness to a bloody coup, in which foreigners become the main target. 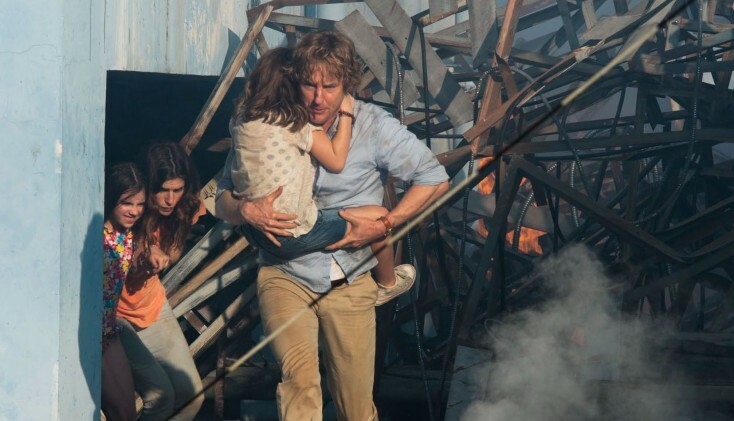 Along for the unfortunate trip are his wife (played by Lake Bell) and their two young daughters (Sterling Jerins and Claire Geare). They are aided by a mysterious English expat played by Pierce Brosnan, in full “Matador” mode. 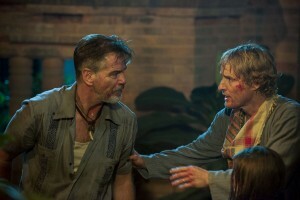 “No Escape” marks Wilson’s return to the genre after previously starring in the 2001 war drama “Behind Enemy Lines.” Since then, the Dallas native has mostly made comedies and a few action comedies where his wit—rather than his physical prowess—was on display. The tow-headed actor arrives for an interview toting a cup of green tea. He warns that he may get up during the interview to pace, since he has started a new fitness program. Wilson appears jovial and joyful as he talks about his new action movie, possibly re-teaming with Jackie Chan for another “Shanghai” sequel, being a dad, growing up in a brood of rambunctious Texas boys and more. Wilson: I wish I had. I would have set some records. Q: Did you read the script really carefully to see how physically demanding the role would be? Wilson: I read the script and thought it was kind of an exciting story. Then I met with the (Dowdle) brothers. But it’s one thing to read it and another thing to be in Shang Mai, and we’re standing on top of this building, where it feels like you’re standing on the tarmac. It’s so hot. Q: How crucial was it that you weren’t perceived as an action hero? Wilson: When I read the script I tried to imagine myself playing it. If it had been written if it was more for The Rock, where suddenly he picks up a grenade launcher and starts doing that stuff, I probably wouldn’t have connected to the story because I wouldn’t have been able to see myself in that way. The way it was, especially the beginning scenes, those scenes felt very familiar with the kids. I felt like I’d done those in movies before. And then, suddenly, the rug gets pulled out from under you. Wilson: You definitely get more cardio on these movies than you do on comedy. Although in “Zoolander” we do have some runway stuff where I’m walking around. (He laughs.) But I had a good time on this. I really got along with the Dowdles, and I really appreciated their ideas and just sort of how they managed the set and managed us actors. That made it enjoyable. Q: How was it filming in Thailand? Wilson: Thailand is a great country to film in. The Thai crew was great. It’s a generalization to make, but the people were very gentle and sweet natured. Q: Did the locals know who you were? Did they recognize you from your previous film roles? Maybe your “Shanghai” films with Jackie Chan? How about your Wes Anderson films? Q: In filming this, did it help that you were a parent yourself? Wilson: It probably did. I do think it’s just the way humans are hard-wired—we want to protect children. So I think even not having had kids at the time, we had these great actors playing our daughters. They’re still young kids and you see in their faces that they’re trying. These were intense scenes that we were doing and it was easy to sort of connect with them and understand what they were feeling. A lot of it was I would think about my dad, and just the stress that my parents had with us kids. They just worried about us constantly. We always had to go get stitches. Because of our BB gun wars, we were always making trips to the emergency room because of that or because somebody had fallen out of a tree. And that’s before we even got to be teenagers! Then, they worried about us going out at night. “What time are you coming home?” they’d say. There’s a lot of stress that I could see with my dad worrying about us. So I kind of think about that a little bit with this movie. Q: How grueling was the shoot? Being so physical and action-oriented and being in Thailand with the heat and insects, did that make it more challenging? Wilson: I didn’t think of it as that; I thought of it as kind of helpful. That’s just one less thing you had to act. It was hot and it was kind of tiring running around holding (a child), especially when the (young actresses) would finish their day and their stunt doubles would come in. They looked the same as our actresses, but one of the doubles was denser. She was just heavier to carry. So, it kind of helped me with making stuff believable. Q: You didn’t pump up at the gym beforehand, did you? Wilson: No, because my character wasn’t supposed to be in top shape, luckily. I always play sports, though. I’m pretty active. If I had been maybe really out of shape, maybe it would have been really hard. But it worked. Q: The scene where you have to jump from rooftop to rooftop feels visceral for the audience watching it. What was it like actually being there on location and doing those jumps? Wilson: That was actually a day that my son, Ford, visited and so I was trying to explain what I was doing to him. He kind of thought of it as a cool ride. He wanted to do it. I just wanted it to look believable. The Dowdles had kind of tested the stunt. John (Dowdle) used his son, Henry, in the pool. He would keep throwing him in to see how far he could toss him. Q: How was it working with Pierce Brosnan, who has a little experience in action films? Q: Has this film whetted your appetite to do more action films? Wilson: Yeah. After I did “Behind Enemy Lines,” I didn’t really do any more films like that, where I’m running and stuff. I haven’t really thought about it that way, though. It just sort of seems to be what you get offered or what you have a chance to do, and for me if I could see myself doing it or doing a good job with it. Q: Would you be down for another “Shanghai” movie with Jackie Chan? Wilson: Yeah, I definitely would I love working with Jackie. In fact, yesterday, I was interviewed for a documentary about Jackie. There have been some talks about maybe doing a “Shanghai Dawn.” We’ll go to China. Q: You brought up “Zoolander,” so I feel it’s fair to ask you, how are things going and are you finished shooting the sequel? Wilson: Good. We finished in Rome. We were shooting there for almost four months. It’s odd to be doing a sequel to a movie that we made 14 years ago. It didn’t do that well at the box office when it came out. I don’t know how this one will do, but it seems like people are excited about the idea of us doing it. So, we’ll see how it turns out. Q: How was it returning to your character after so much time has passed? Wilson: It wasn’t hard. It was a little nerve-wracking just the way we announced the movie. We were in Paris (for Fashion Week) and it was all very secretive. Ben (Stiller) and I kind of walked out for the fashion show in our characters. Then, it got a great response that day. It was in the daytime in Paris when we walked out, but it felt like we were rock stars because people were really cheering for us. Q: If you could return to another character you’ve played, who would it be and why? Wilson: I liked my character in “Midnight in Paris.” I remember reading that script and thinking, “How is this going to work with time travel? How is Woody Allen going to do that? And he just didn’t do anything. It’s just the car comes along and then you’re in the past.